I have a little free time tonight so I thought I would begin this blog at home rather than in an airport waiting for an invariably-late connecting flight. I’m off to Beirut again tomorrow. I’ve gotten used to folks here in Montreal raise their eyebrows when I say that. After their initial shock they ask, with a worried look on their face, “Is it safe there?” “Today it is,” I reply. Equitas is holding an evaluation meeting in Beirut from February 20 to 23 for participants in our Middle East and North Africa (MENA) program. We’re taking a closer look at 20 local human rights education projects they undertook over the last couple of years. The English manual is packed away somewhere in my bag and I guess I’ll read over it before we begin Thursday afternoon. I’ll also take the time to read once more the messages posted on our latest virtual conference, which I’m very happy is generating a lot of interest early on. So I won’t write about human rights education to start off, but about an act of kindness. Last November, one of the MENA participants told me of the street children cared for by his centre in Baghdad. The centre cares for about 100 children with the aim of providing them with a safe environment which also meets their basic needs. The centre pays particular attention to children who have spent time in juvenile detention centres or who have been victims of police abuse. The centre provides services such as basic health care, reintegration into school, legal and psychosocial support, and recreational activities. In other words, they make sure that kids get to be kids. Last week I asked my wife Carolyn, who teaches students in Grades 3 and 4 at a school here in Montreal, if she wouldn’t mind making an appeal to the parents of the students for any clothing or school supplies. The letter was sent out and the parents replied with a kindness I found overwhelming. By the end of last week, hundreds of articles of clothing filled my living room, all freshly laundered and neatly folded by the parents and their children. One parent even presented Carolyn with funds to be given to the centre. Oh ya how old are you? I like math. Do you? My favourite colour is blue. What’s yours? And on it goes. 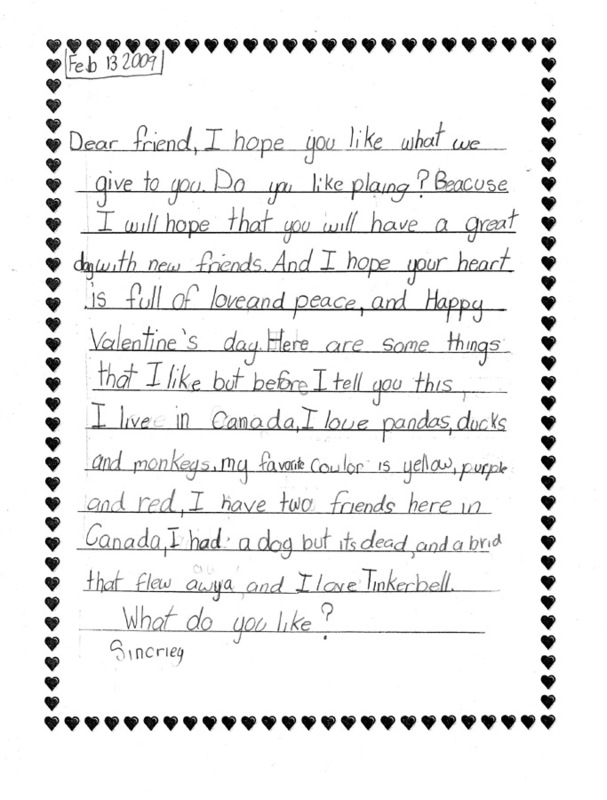 When I told my friend in Baghdad that the children here in Montreal had written letters, he wrote back, “I cannot tell how that will make children happy, especially the letters because it will make them know that there are more people who care about them.” That’s it, isn’t it. Make sure that kids get to be kids.